Art is the Voice of the Soul. Janet K. MacKay is a sculptor and painter working out of Worldview Studio and Gallery of Fine Art, located in Ottawa, Ontario. She received her degree in Fine Arts from McMaster University and, after a government career in design and project management, she returned to her artistic roots in 1998. Janet’s oil-on-canvas paintings primarily capture the landscapes of Ontario and Quebec. Although her painting style is distinctively her own, it has been likened to that of the Group of Seven. She is presently working on a series of paintings depicting reflections of boats—from canoes and kayaks to fishing vessels. Her paintings are vibrant and distinctly Canadian. Janet’s bronze sculptures have an Art Nouveau flare and are primarily figurative, often focusing on dance. She is currently working on a series of sculptures capturing the graceful beauty of whales. Janet has participated in numerous solo and group shows and enjoys these opportunities to see, first hand, that spark of connection her art can make with its audience. This beautiful world and its inhabitants excites me so much, that I want to capture the power of this feeling and share it through my art. I try to convey a moment in time that is precious, beautiful and inspirational. This applies to both my sculptures and my paintings. I am an optimist. I feel there is too much attention given to the travesties of man and our environment. Although conscious of the need to be aware of these problems, I still see the beauty and believe in the law of attraction – that if you focus on what is good, it brings more good. I like Art to be beautiful. My goal is to take the viewer to a place that is peaceful and uplifting. The natural environment that surrounds me inspires my paintings. I always have my camera close at hand – as those breathtaking moments have a way of presenting themselves unexpectedly. I often travel many miles looking for that perfect landscape, sky or reflection, only to return and find it in my own backyard. Very few of my photos come close to capturing the experience. Have you ever noticed that your photo of that sunset that took your breath away, just didn’t do it justice? I feel that my job as a painter is to breath the life and spirit of the experience back into that scene that my memory recalls and which the camera could not. My oil paintings start with a red canvas onto which I sketch with black paint. From this base, I layer up the colour. Somehow that red breathes life into the painting, and the black under sketch makes the colour vibrate like in a stained glass window. 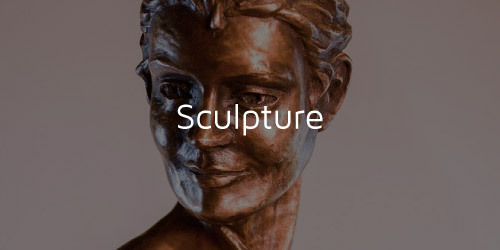 My sculptures primarily feature the human form at its finest to express the best of the human spirit. Their strength and endurance translates into movement that appears effortless and lighter than air. I sculpt in oiled clay from which I make molds so that my sculptures can be cast in bronze. This process is long and arduous – not unlike that which my subjects must go through to reach their perfection. Art is my language – it is my way to convey to the world what is important to me. It is a conversation that can only be completed by the viewer. That connection is what my Art is all about.